Load Banks Direct has assembled a team of load bank industry experts (with over 100 years of combined experience) along with the financial backing of Powerohm Resistors (America’s largest manufacturer of power resistors) to bring you the finest load bank products and support available anywhere. We now offer a complete line of standard and custom load banks including freestanding (outdoor stationary) load banks, portable load banks (with caster wheels), radiator mounted load banks, or mobile load banks (trailer mounted or containerized). All our load banks are 100% Made in the USA complete with user-friendly controls and many improvements over load banks typically found in the industry today. Each LBD load bank is constructed of heavy gauge galvanized steel with polyester powder coat paint to achieve a durable, long-lasting finish. 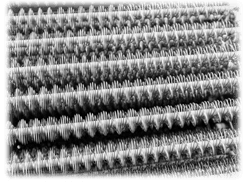 The resistive load sections feature LBD’s PowerDyne™ wound load elements, fully supported across their entire length within the air stream on stainless steel support rods with high-temperature ceramic insulators. Load stability is optimized by maintaining conservative resistor designs. Each load bank also includes many important safety features such as fused load steps, blower air-fail switch, exhaust over-temperature switch, blower motor overload protection and appropriate warning and caution signage located on the load bank access panels. Our freestanding load banks are designed for outdoor, stationary installation and feature fork-lift channels in the base for easy installation and lifting. The load bank control panel is mounted in a NEMA-12 control enclosure which is suitable for remote mounting and comes standard with each load bank assembly. These load banks have screened cold-air intake and screened/louvered hot-air exhaust for superior all-weather protection. All exterior fasteners are stainless steel for long life. 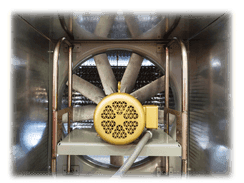 Each load bank features a high performance blower system, optimally designed for maximum cooling. Our portable load banks include heavy duty caster wheels and are designed for temporary indoor operation or rental service. 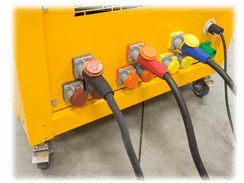 Dual-voltage operation, local operator controls, digital power metering, and quick-connect Cam-Lok load connectors are standard on the portable load bank models. These load banks also feature screened cold-air intake and screened hot-air exhaust for personnel safety. Our standard portable load banks include power capacities ranging from 100 kilowatts to 700 kilowatts with standard load step resolution of 10 kW. These load banks are typically used for high power load testing of emergency power systems including generators, uninterruptible power supplies, turbines, battery systems and regenerative power absorption of large motors and other load applications. Our standard freestanding load banks include power capacities ranging from 50 kilowatts to 2500 kilowatts with standard load step resolution of 25 kW.